Measles has been in the news (even in the Straits Times) lately, because of the U.S. outbreak that originated from Disneyland in California. To briefly recap, at least 40 visitors/workers at Disneyland, California were exposed to measles in December last year and have developed the disease. The index case (or cases) has not been identified, but is possibly a Disneyland visitor (or visitors) from overseas. There are now many secondary cases (i.e. those infected after coming into contact with the initial cases who were exposed to measles at Disneyland), and that number is expected to rise exponentially. Below is a screenshot obtained from the CDC webpage describing measles and outbreaks: there was clearly a huge jump in cases in 2014 (644 – the most since measles was declared eliminated in USA in the year 2000), but it is quite likely that this number will be exceeded this year. 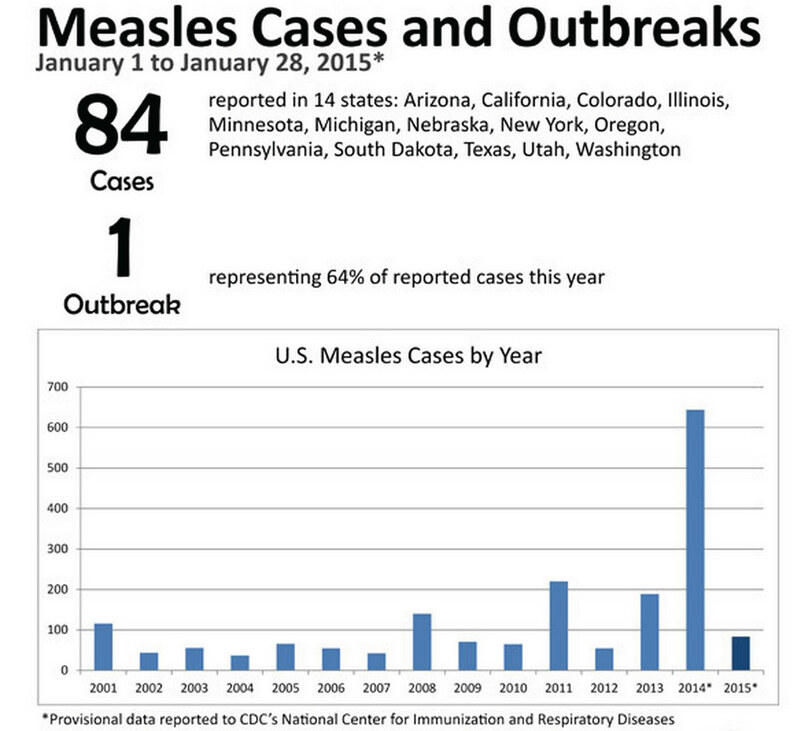 Measles in the US (screenshot from the CDC webpage on measles). Singapore also had a huge spike in measles cases last year in 2014 – it was even reported in the Straits Times in May 2014. It was believed that this was due to the huge measles outbreak in the Philippines – there is considerable traffic between Singapore and Philippines, and – if you believe this Wikipedia page – there are more than 170,000 Filipinos living and working in Singapore. There were 141 cases of measles in Singapore last year, and none to date this year. From the screenshot below – obtained from the latest (Week 3) Infectious Diseases Bulletin published by MOH – it is clear that the outbreak in Singapore died down near the middle of the year. The current measles outbreak in the US appears to have re-ignited the fight against the anti-vaccination campaign – you can read any of multiple articles at Wired, Dallas Morning News, New York Times, etc. The “anti-vaxxers” are those who mistrust vaccination, blaming vaccines or their ingredients for causing a whole range of problems including autism. In the US, at least, many states permit parents to exempt their children from vaccination on the basis of personal or philosophical beliefs. In Singapore, MMR vaccination is compulsory, although the actual coverage is close to 95% rather than total, because a child can be certified unfit for vaccination in Singapore by a medical practitioner, although MOH will have to be notified about this certification. One can see vaccination exemption (especially for non-medical reasons) as one among many issues in the perennial “individual rights vs. public health” debate. There are a couple of good articles that provide the ethical and legal framework for this debate in Angles at MIT and Harvard Law School. In some ways, like most doctors (but clearly not like this one) – especially paediatricians and infectious diseases practitioners – I fail to see how individual rights should trump public and community health where vaccinations are concerned. How is it that people who are already vaccinated against measles generally form the bulk of the cases in outbreaks (although not for this current Disneyland outbreak…yet) in developed countries? There is a statistical answer for that question – the MMR vaccine is at least 95% effective at preventing clinical measles if at least one dose is received. Far more people (especially in countries like Singapore) will have received the vaccine than be exempted. Hence the actual number of cases of vaccine failures will generally be greater than those who who contracted measles without ever having been vaccinated.